Today’s question sounds a bit weird, but here is my answer nonetheless. My favourite die is the iconic d20. I met it first in Das Schwarze Auge, but with D&D it became a true symbol. 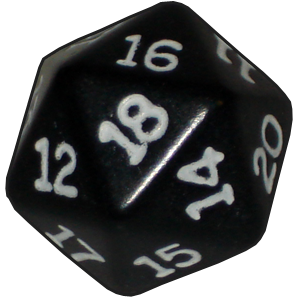 I generally like to play games which use many different dice. Don’t ask me why; it is a totally irrational thing. And though I love gaming systems like Rolemaster or The Riddle of Steel, having to roll some good, old d20 just makes me happier.